We saw a strong week for markets and select stocks as bears back-peddled from their mountaintop cries calling for a major downturn. To me it still seems we’re in a major bull market, but still early, and any corrections should be relatively shallow as we just saw. We aren’t going straight up though as markets always, always need to take a breather from time to time. We had that breather from March until up until two weeks ago. The correction was the right amount of time and we are just emerging from it now. We’ve had some really good gains the past couple weeks and a couple stocks are breaking out from major, completed patterns while there are many more stocks who are still completing bases. It is looking like it will be a busy summer, but a good and profitable one. As for the precious metals, gold and silver aren’t yet even able to show me a dead cat bounce. 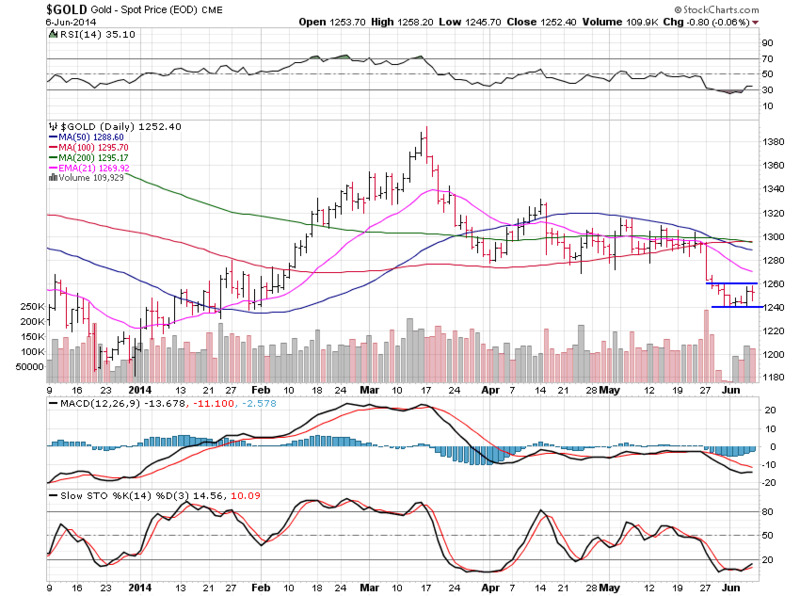 It is not looking good for the gold perma-bulls but that is their own problem. If you can’t adapt and change your views as things change then there is no way you’ll ever make money in the stocks market. Let’s move right to the charts. Gold gained 0.15% this past week but is just resting before it most likely heads lower once again. Some people are calling for a bottom already but I don’t see any sign of that at all. All I see is a small bear flag building between the range of $1,240 and $1,260. If we do manage to break above $1,260 the next resistance level is $1,280 but I don’t see that coming. From what I’m seeing, the next major move is back down to lows at $1,180. I’ve talked about my view that the $1,000 area will be tested again this year and that view did not change this past week. We need to really see the capitulation that so often marks lows and we have not come close to that yet. Silver rose 0.96% for the week and is just setting up for lower prices along with gold. Silver is stuck in the $18.75 to $19.25 range. As far as I can see we are still on our way back to $15 and I’m not sure what can change that view. Strong price action with great volume would do wonders to the upside but I can’t see a reason for that to come anytime soon. Platinum can float higher pretty well while gold consolidates recent weakness since it is not the focus of traders for the most part, or you could say, it is not under the same pressure. 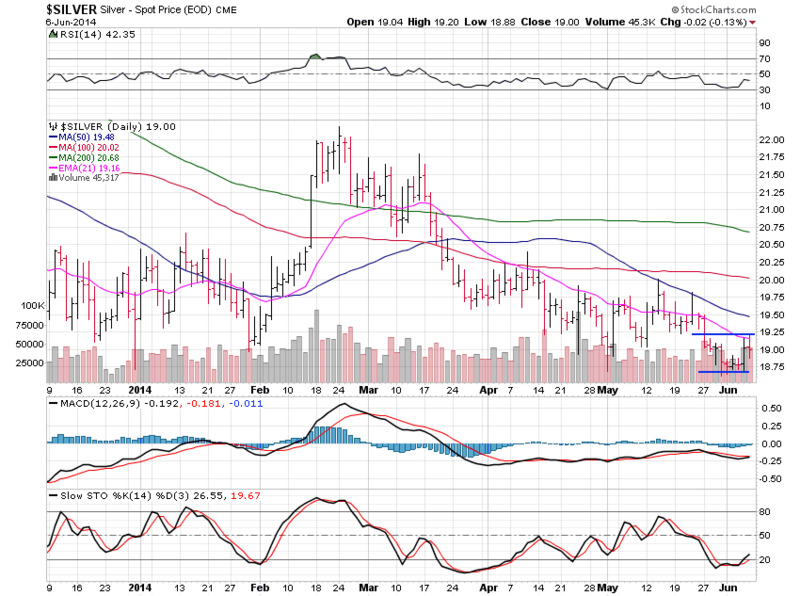 Once gold resumes it’s move lower though, platinum will follow. This move could take platinum back up near $1,490 but that would be all the upside I can see coming. 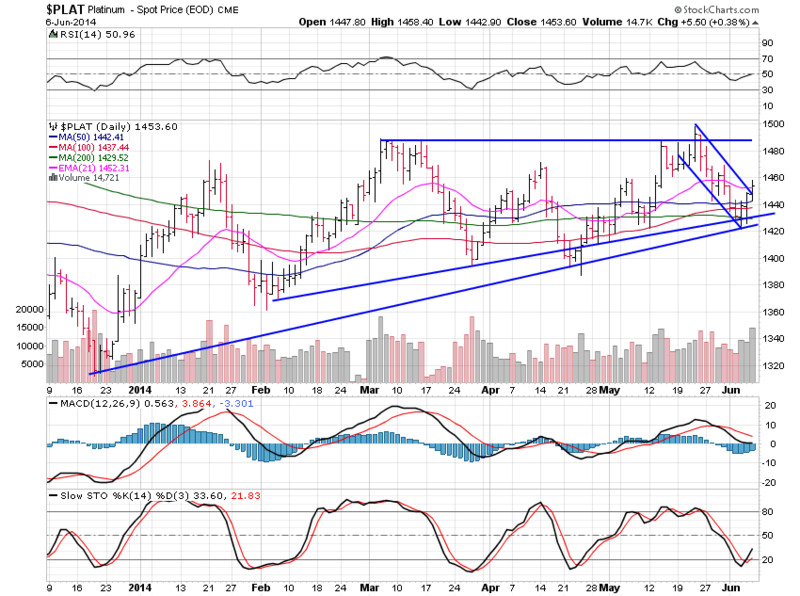 Palladium only gained 1.19% this past week and Friday saw it breakout higher on a nice increase in volume. I've talked about palladium being the only real pocket of strength in the precious metals arena and it is showing just how strong it is now. Palladium is on the cusp of breaking into new all-time high ground above $862 and that move is coming right now. 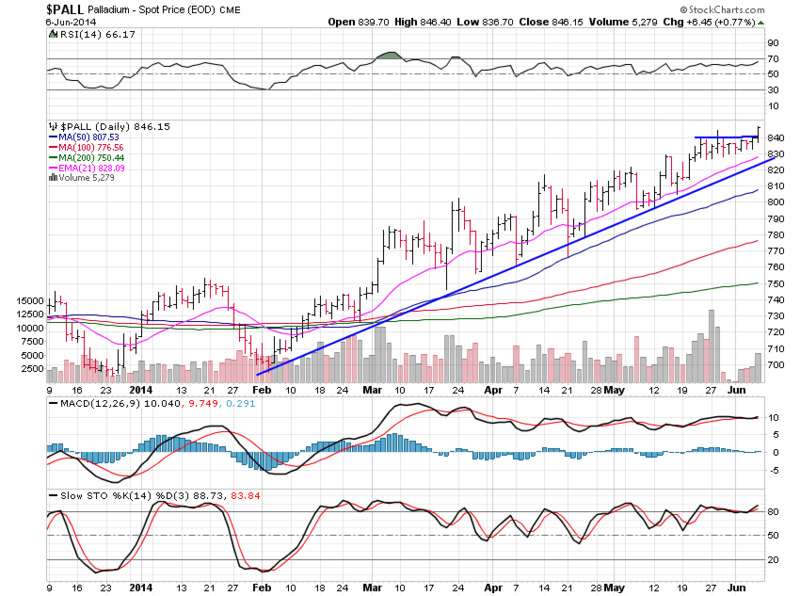 Such a nice strong move lasting from February until now and we are starting to see this move accelerate to the upside. As long as we remain above $840, this move is working and as long as gold doesn’t tank right away we should see a move towards $900 over the next few weeks. Great stuff and this is a much more conducive chart to my style of trading. ngth, or charts who are moving towards the upper right. Why bother goofing around trying to trade a poor acting stock when there are strong acting charts around? I don’t see any point in being adamant about any specific stock, market or chart. All I want to do is make money and do it in the most stress free way possible.